Much has been written about the importance of brands embracing storytelling — or, at the very least, becoming better at creating more dynamic audience-facing narratives. The goal of advanced content marketing is to enhance a brand’s ability to influence behavior through sustained content creation, fundamentally changing how audiences perceive that brand. This progressive approach to operationalizing editorial content has driven many marketing teams to start evolving into newsrooms. But while some businesses are modernizing their approaches to content, many more are struggling to get meaningful start-up investments to market. The marketing innovation investments being made today are heavily focused on the digital channel — in programmatic ad buying processes and big data in particular. But this may be shortsighted, as even a limited investment in content marketing can yield critical big-data insights that can enhance marketers’ overall efficiency and effectiveness. Therefore, it’s my assertion that any serious investment in data-based ad buying should be coupled with some investment in content as well — it’s a classic case of how the tide of content can raise all boats. The idea of distributing an article that contains no commercial messaging is still very foreign to many marketers. For brand marketers in particular, it’s difficult to believe that an editorial article (containing no commercial features or benefit messaging) can achieve the same reach and influence as a display ad, for instance. However, content can provide the reach they seek, thanks to the development of content discovery “engines” such as Outbrain and Taboola (among others). And, a real opportunity for marketers now exists to drive business impact using this modern distribution network more appropriately, and in tandem with “traditional” digital advertising instruments. Display ads have proven themselves to be effective brand awareness vehicles. Yet, engagement and communication capacity are limited and are typically measured in seconds — and usually in the low single digits at that. Display ads work more effectively with some context (e.g., marketing’s huge push toward programmatic, or data-based ad serving). They can be a costly direct-response mechanism, as click-through rates are low — less than 0.1 percent on average (according to research from DoubleClick). While display ads and rich media are relatively inexpensive to produce, compared to other forms of dynamic media, producing multiple iterations with diverse communications is typically cost-prohibitive for many businesses. Consequently, display ads are usually relatively static over the course of a multi-week or multi-month campaign. An editorial article is one of the most cost-efficient forms of content to create. This low cost allows for a broader range of messaging options or topics that can be covered (so you get more assets for a given campaign). 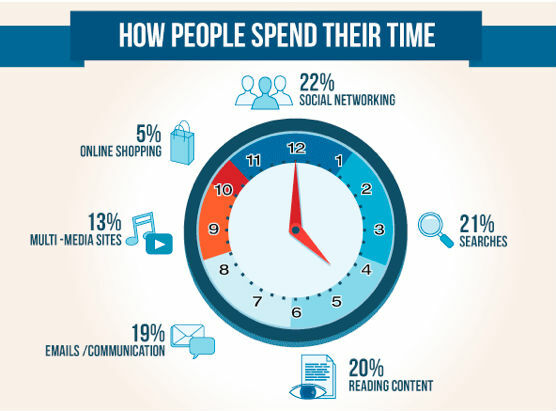 The time spent viewing/reading and interacting with articles is glacial compared to display — 20 percent of all time spent on the web is devoted to reading content. Article distribution scale has hit critical mass — for example, Outbrain alone is now number three (behind Yahoo and ShareThis and ahead of Google and Facebook) in ad-focused-reach; and, it is now seventh on comScore’s unique visitor audience rankings. Sources: comScoreDataMine.com, Nielsen.com, PewInternet.org, and TNSDigitalLife.com. Image via Go-Gulf.com. Display ads are poor at audience interaction and distribution but are solid awareness vehicles. However, they require context to optimize their effectiveness. Articles, on the other hand, are far more effective and efficient in generating interaction and distribution — critical to fast data generation; thus, they make for better contextual data gatherers. Yet, articles need support in their efforts to convey an overt brand benefit or call-to-action (i.e., asking for the sale). So the conclusion here is that content and display are like yin and yang… the chocolate and peanut butter of the digital world. Any brand looking to optimize its investment in programmatic buying should first establish operational proficiency with content syndication and/or discovery. This combine-and-conquer effort is critical to maintaining the left and right brain balance that’s essential to any successful digital marketing plan. Programmatic display campaigns require consumer behavior data to optimize its effectiveness. 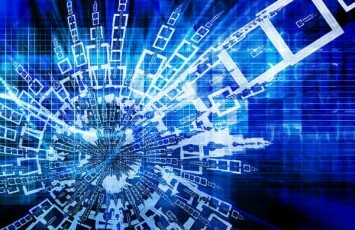 For that matter, paid and organic search techniques also require data insights to be optimized. Distributing editorial content yields more (and higher-quality) data, because this content is what audiences inherently and predominantly interact with online. We won’t spend time here on the subject of mining data to use in story development (a topic that’s been covered extensively on the Content Marketing Institute website). Rather, we’ll focus on the role data plays after editorial content has been published and distributed. Paid syndication of article (and video) headlines across content discovery engines, such as Outbrain and Taboola, can yield a vast array of behavioral data that can help marketers tailor subsequent engagement messaging. For example, a click on a compelling headline is likely to be a more accurate indication of a user’s interests and intentions than a click on a display ad — according to an eMarketer report, only 15 percent of consumers trust display ads completely or even partially. Additionally, article interaction can play a critical role in optimizing the context in which display ads are served, resulting in better receptivity and more efficient performance. Combining the data from the initial click on a headline with the behavioral data downstream of the click, on a brand’s website for instance, enables a marketer to assemble a more complete profile of a consumer that can be utilized to inform engagements even further downstream — such as in a display ad. Here’s an illustration involving LasikPlus, a leading LASIK surgery provider. LasikPlus has a well-informed editorial strategy based on a number of behavioral data sources. However, informed editorial strategy in and of itself isn’t necessarily an accurate predictor of article interest or performance. Both articles follow the same editorial strategy, in that they’re focused on addressing an insight that audiences need more information around — the efficacy of the procedure. 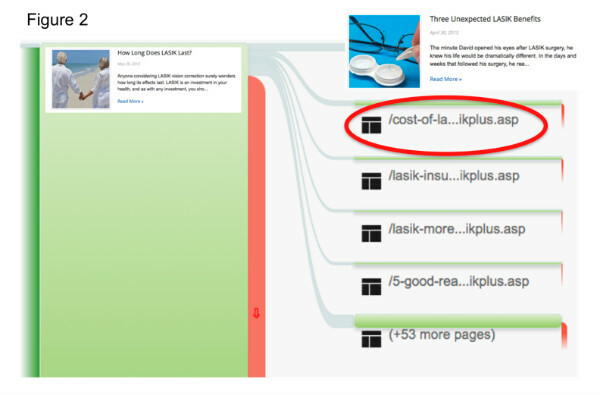 However, the article on the bottom dramatically outperformed the article on top in generating audience interest, click-through and, most importantly, traffic to LasikPlus‘s site. This media performance data can be leveraged to optimize the syndication spend, maximizing LasikPlus‘s investment in assets that yield traffic most efficiently. When analyzing click-through data further in conjunction with web analytics data, each article reveals a slightly different user behavior path — which might signal the need to create a different post-engagement messaging strategy. As the report in Figure 1 illustrates, visitors enticed by the benefits of LASIK beyond treating nearsightedness also clicked over to the “How Long Does LASIK Last?” article, as well as to another article about additional benefits of the procedure. Visitors stemming from this entry point were also clearly interested in investigating the costs associated with the procedure, albeit in a lesser volume. 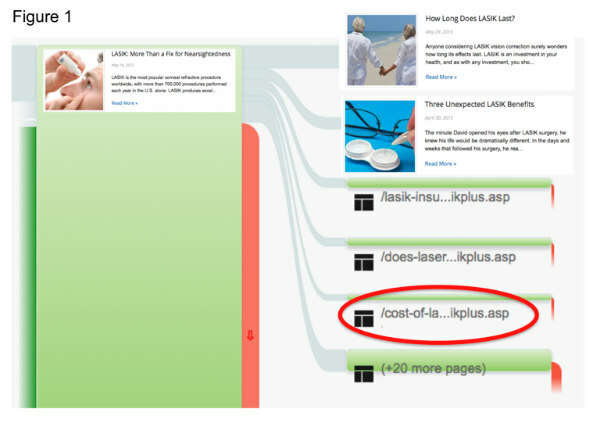 As the report in Figure 2 illustrates, visitors initially clicking through on the How Long Does LASIK Last? headline spent a little less time on LasikPlus‘s site. This is particularly revealing: While one article did a better job of driving traffic to the brand’s site, the other article was better at churning this traffic and sustaining on-site engagement. The data also indicates that visitors in this pool were interested in reading about additional benefits of LASIK, as well as cost information (although to lesser degrees). Collectively, both user paths reveal powerful insights and important data points with which to target and re-target users with varying display ad messages. As the figures above illustrate, depending on what content a user has engaged with — and in what sequence — specific messaging on the LASIK procedure’s benefits, efficacy, or pricing may be more appropriate at a future engagement point. Over time, this data is valuable in shaping buyer personas and determining at what point prospective customers are in their purchasing process. LasikPlus understands that consumers often spend many months researching and considering a LASIK procedure before seeing a doctor. Behavioral data stemming from interaction with content can help reveal insights around communication opportunities to sharpen commercial messaging, or in other words, what message to serve up and when. As many brands are escalating their investments in content marketing, many more are struggling to justify a meaningful initial investment. Article distribution, or treating content as an ad unit, can be the perfect tactical approach with which to get started. Further, the data gathered from this initial foray into the content marketing space can provide valuable insight into how to craft a meaningful, long-term editorial mission — setting the strategic stage for a more sustained content marketing investment down the line. For more insight and instruction on setting up your organization for content marketing success, Join David Germano for his presentation at Content Marketing World 2013. David Germano is the president and chief content officer of Magnetic Content Studios. Since 2012, Magnetic has been focused on helping brands create experiences that attract and nurture audience relationships. David is also the co-chair of the ANA’s content marketing committee. You can follow David on Twitter or on LinkedIn.